A lawyer from Colorado, having been a pilot during World War 2, Lt. Brubaker, played by William Holden, is recalled to the US Navy. 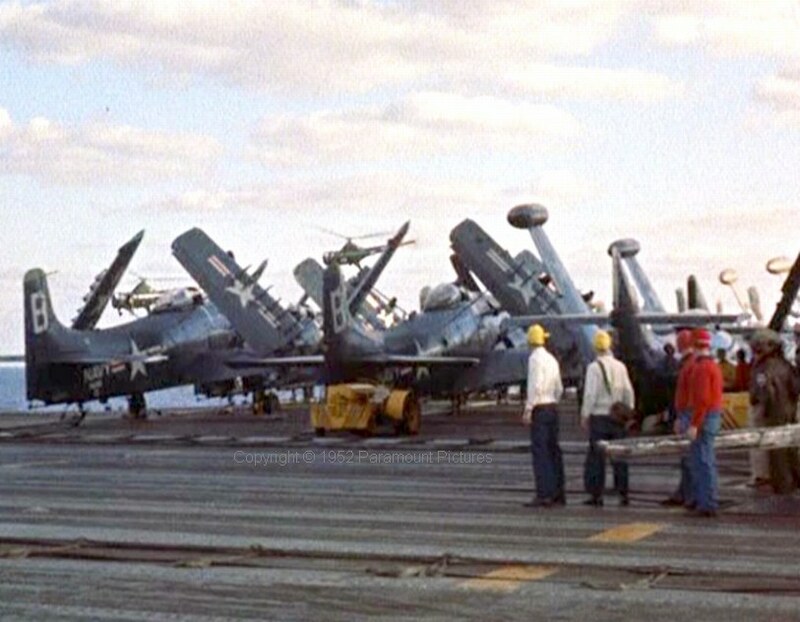 He is on an aircraft carrier with Task Force 77 off the coast of Korea in November 1952. This movie is based on a novel by James Michener. 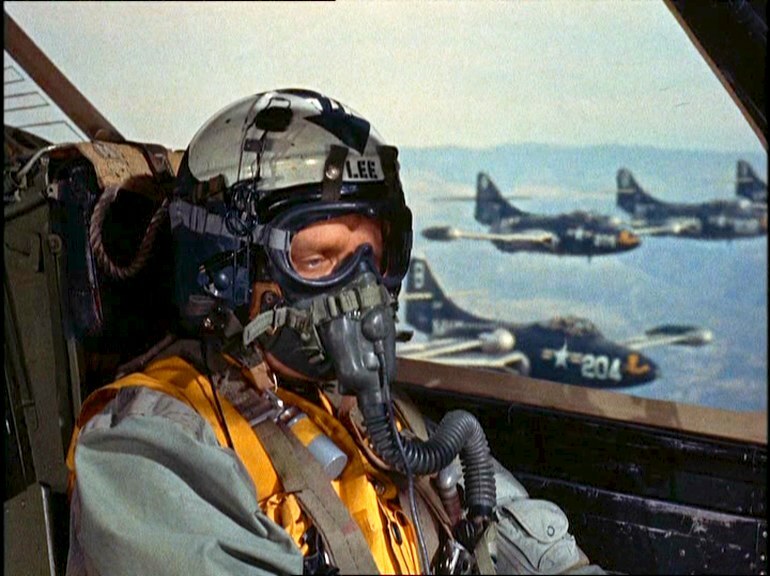 Filmed shortly after the end of the war in Korea, the film contains plenty of flying action. Ditching in the freezing ocean near Korea in the 1950s was fraught. If a swimmer had to jump in to attach you to the hoist, he had to be rescued by a second helicopter because the Dragonfly had no means of winching up a second person. 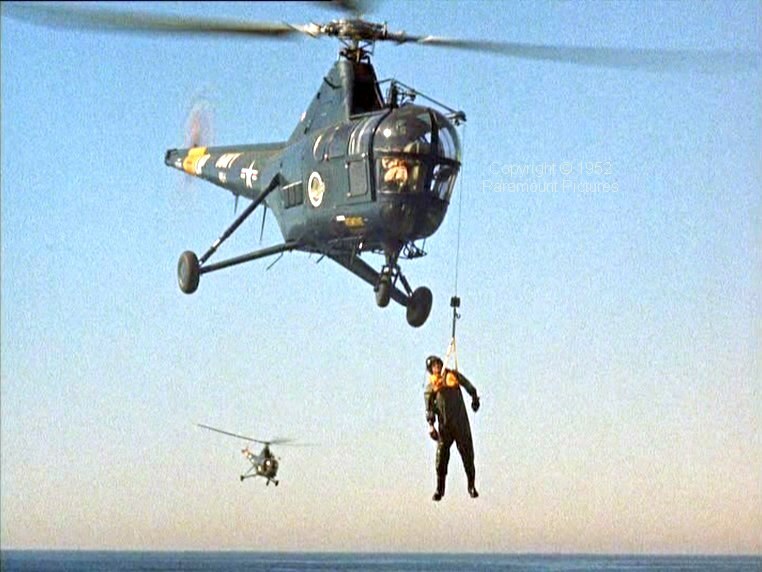 That second helicopter, which had better not malfunction, needs to be on the scene quickly enough so the swimmer’s hands are still working well enough to get into the hoist. Usually there was no third helicopter. The two Dragonflies return, here partly obscured by the folded wings of Skyraiders and Panthers. 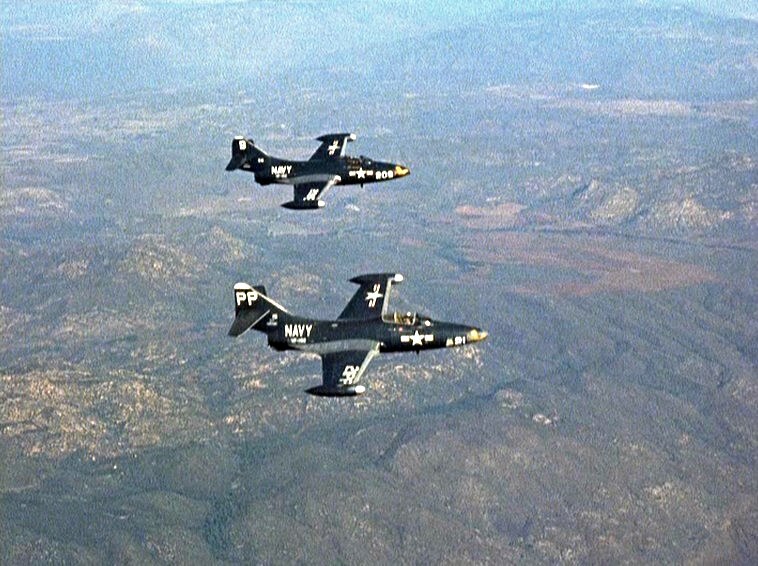 While the sleek jet-powered Grumman F9F Panther was retired after the war in Korea, the rugged piston engined, propeller driven Douglas A-1 Skyraider, which first flew at the end of the Second World War, continued in service to provide air cover during rescues of downed airmen in Vietnam. 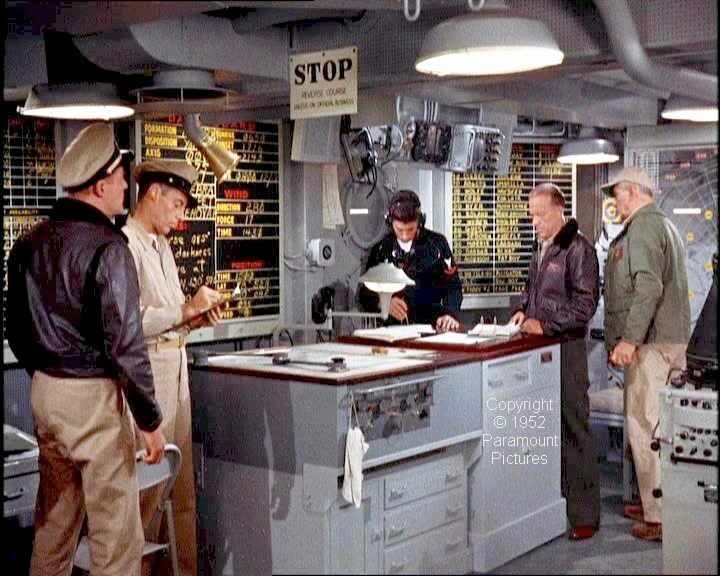 A Panther has flamed out and, aboard the aircraft carrier, Admiral Tarrant (played by Fredric March, here in green bomber jacket and tan baseball cap) listens to the radio calls. 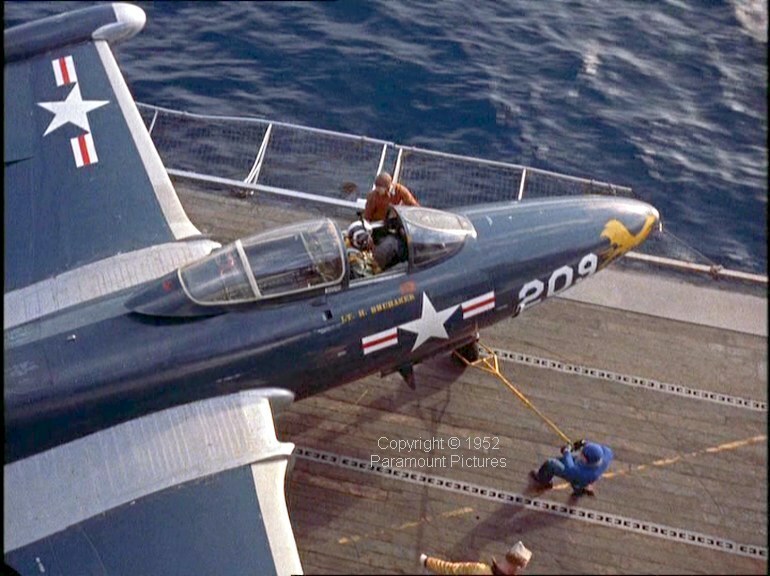 This Panther, with a qualified man in the cockpit, is on an elevator rising to the flight deck. 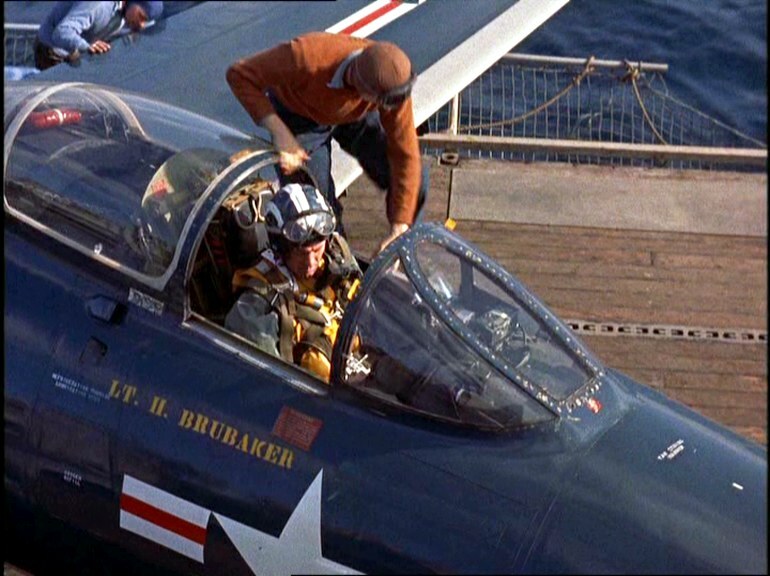 As it nears the camera, actor Holden is revealed strapped into the ejector seat (the aircraft by then being in a safer position). If you replay it slowly, you can see the cut, but it is almost seamless. The whole film is extraordinarily well made. 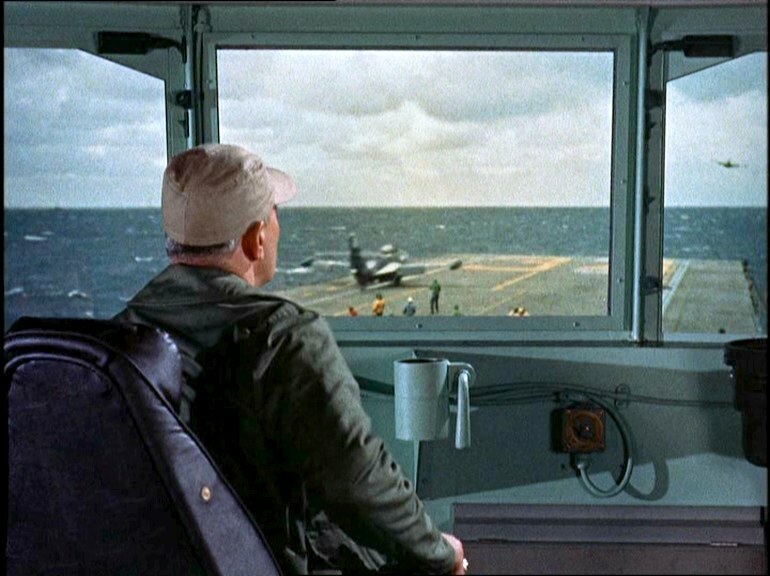 The flight deck action is at least as well filmed as that in Top Gun 30 years later (and 30 years ago as I write this). 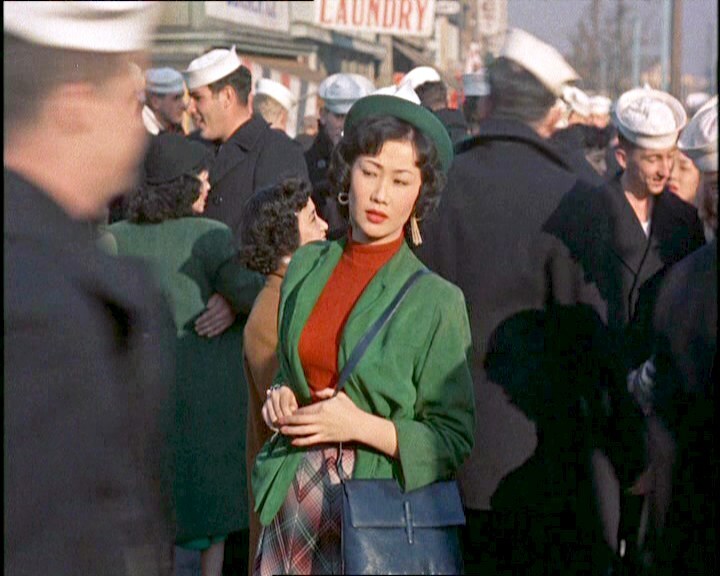 Kimiko is one of several good-looking women in the film. 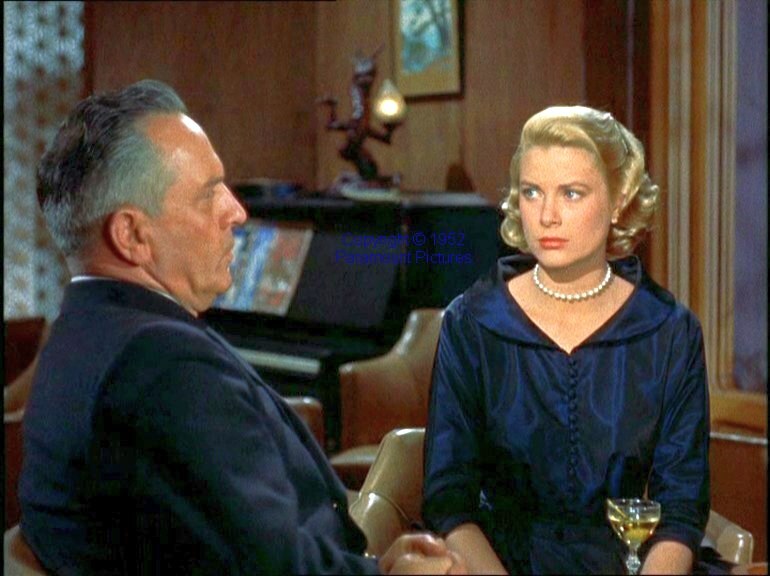 Tarrant explains to Nancy she must understand the risks to which her husband is subject. 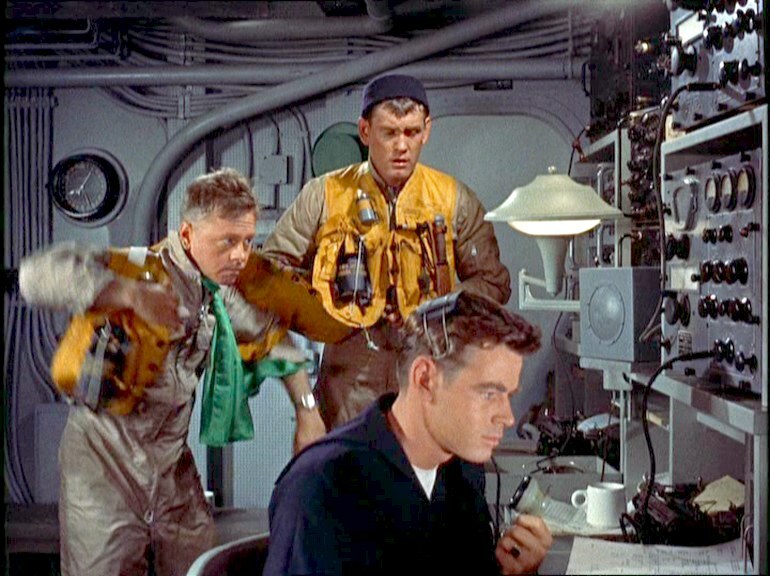 Meanwhile, Able Seaman Nestor Gamidge, played by Earl Holliman, Lieutenant Harry Brubaker, and Chief Petty Officer Mike Fourney, played by Mickey Rooney, manage to stir up trouble in Tokyo. Mike needs Brubaker’s assistance in persuading Kimiko to end her wayward ways and stay with him. 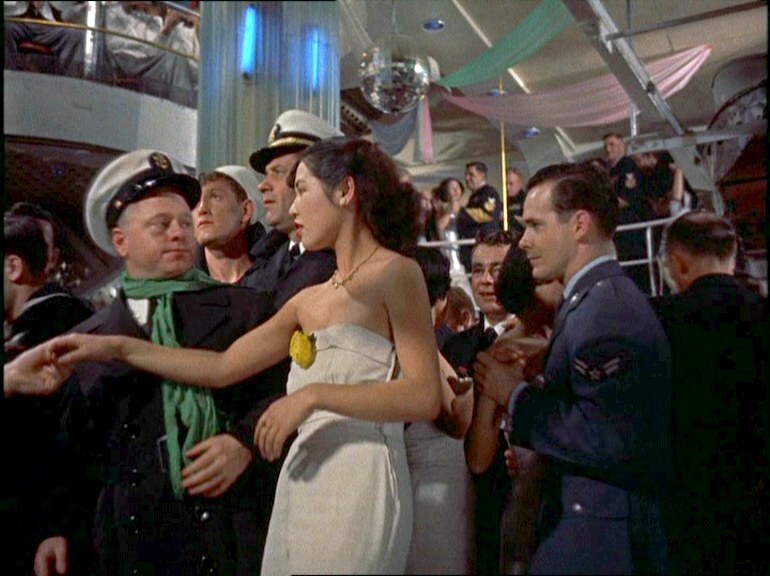 In one scene, CAG Lee has a major disagreement with Tarrant. Much of the air-to-air filming takes advantage of slanting evening sunlight. The battle scenes, actual flying combined with scale model action, compete well with modern effects. 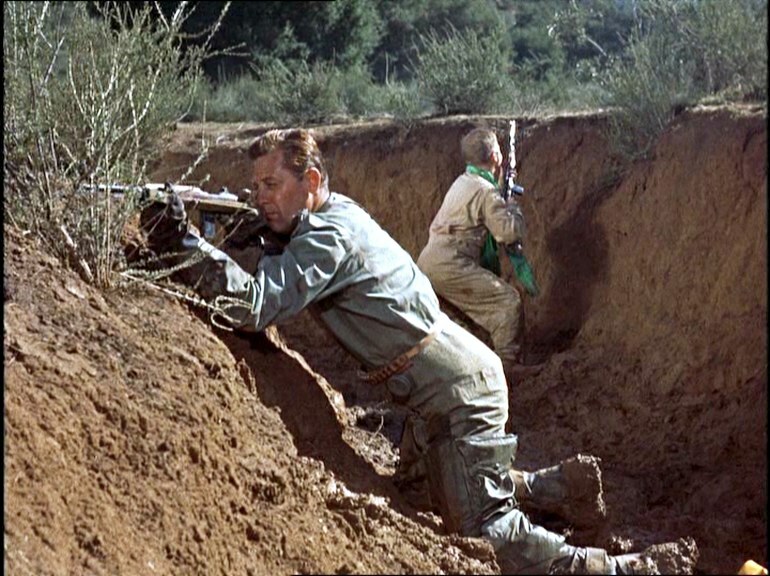 Additionally, according to Wikipedia, some of it is film from actual combat operations. Communist troops reach the crash site before the rescue helo and they search for the pilot. The helicopter has landed but is unserviceable. Fourney and Brubaker are for the moment alone in a ditch a mile from the coast. However, those propeller-driven A-1s that were parked on the deck earlier have launched and are inbound. The helicopter sound effects are not realistic. Also, they used jet noises during the strafing runs of piston-engine A-1s. As is the case with so many aviation films and books, a final proofread or review by a plastic modeller or someone with equivalent broad knowledge would have improved the quality of the final product. The necessarily constructed in-cockpit views sometimes do not look quite right because of the angles. One of the greatest books ever written – and it is so slim I read it in a long evening – is turned into one of the greatest movies ever made. 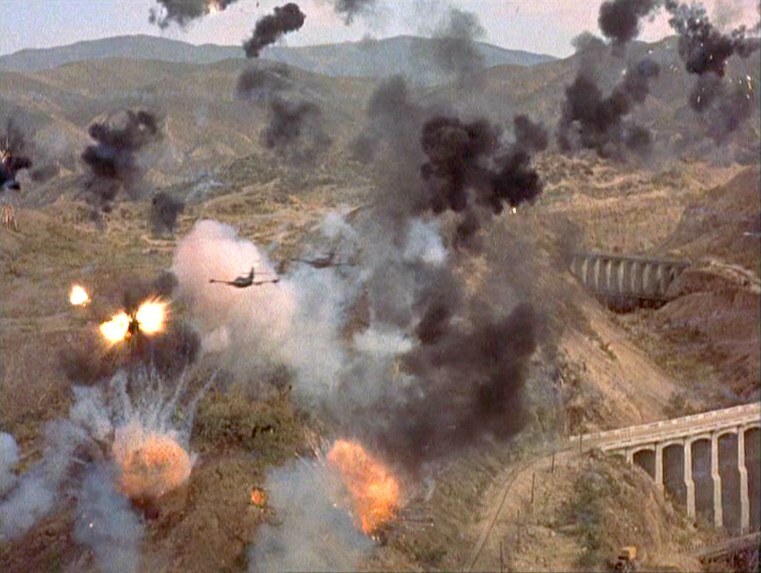 If you are ever asked what the best aviation movie of all time is and you answer anything other than The Bridges at Toko-Ri, you are incorrect. One evening in about 1985 the Eighteen Plus group to which I belonged (not to be confused with the Club 18-30 holiday outfit) we were given a presentation by a Royal Navy rescue helicopter crew. (The venue was an upstairs meeting room of a public house in Christchurch, Dorset, England.) First, they unrolled a rubber dinghy and activated a gas bottle that inflated it. Those of us in the front row of chairs crashed backwards in our haste to avoid being overwhelmed by the yellow rubber monster rushing at us. A slide-show followed. The helicopter pilot provided the narrative while another crewman, who had an award for bravery for rescuing musicians of the pop group Duran Duran from an upturned racing sailboat, operated the projector. The first of the transparencies, colour cartoons, depicted two men in a raft beside a ditched airplane with its tail sticking out of the ocean. The next slide showed one of the men in the life raft firing a flare, which arced towards an approaching helicopter. “Don’t aim the flare at the rescue aircraft,” said the narrator. “Aim it in front, at right angles to its course. That way we will see a long smoke trail instead of just a tiny red dot. 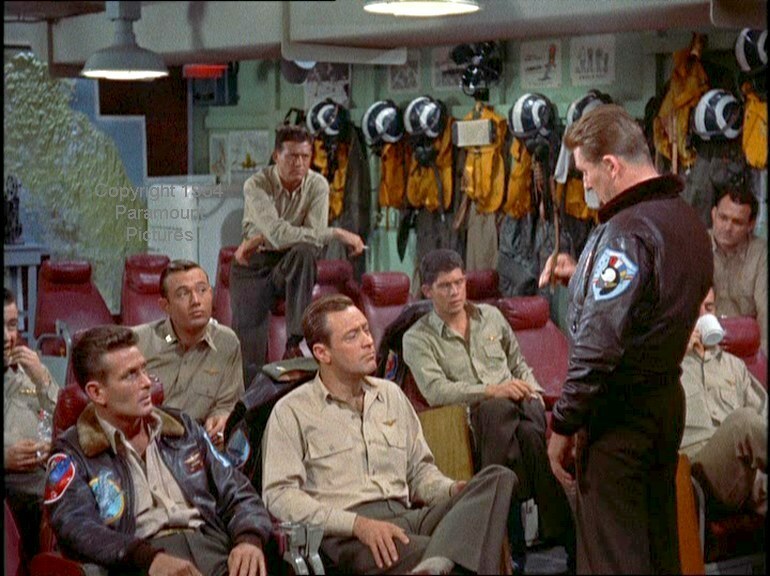 And…” (the slide changed) “you won’t risk shooting down the rescue aircraft.” The new cartoon showed six men, including the original two, all sitting in a large raft. As well as the original aircraft’s tail poking up out of the water, the tail of the rescue helicopter protruded upwards out of the sea. Above the horizon, a second rescue helicopter approached. 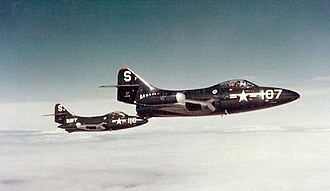 Neil Armstrong, commander of the first moon-landing mission, flew F9-F Panthers during the war in Korea. In this Wikimedia Commons photo, Neil Armstrong is flying the Panther farthest from the camera.